Known as Chanoyu, Sado or Ocha, Japanese tea ceremonies began as far back as the 13th century when Buddhist monks studying in China brought tea back to Japan. At first, powdered tea (matcha) was used for religious practises or medicinal purposes. Soon tea drinking gained popularity among Samurais and the ruling class, becoming a symbol of status and extravagance. Noblemen held Toucha (tea-tasting parties) where their guests would have to tell the difference between Honcha (authentic tea) and others that were considered less flavorful. If the nobleman’s guests guessed right, they received extravagant prizes. By the Muromachi period, between 1336 and 1573, tea ceremonies evolved into Zen Buddhist principles, in particular, the Wabi-Sabi aesthetic. You might be familiar with Wabi-Sabi as our beauty philosophy. It’s a concept in traditional Japanese aesthetic that teaches you to find beauty in imperfection. Wabi symbolizes humility, simplicity and naturalism. Sabi represents all that is imperfect. The Zen Buddhist monk Murata Jukō transformed tea ceremonies from boisterous parties hosted by the elite to a more spiritual practice that included all classes. He believed that the ceremony should centre around four important values: Kin (humility), Kei (respect for food and drink), Sei (purity of the body) and Ji (freedom from desire). Jukō preferred the intimacy of a small room with only a few people as he believed it created a more tranquil atmosphere. By the end of the Muromachi period, another Zen influenced tea master, Sen no Rikyū, pioneered the art of the more formal Chanoyu (way of tea). He emphasised simplicity, directness and honesty; in particular he preferred a preference for simple utensils, rather than the intricate Chinese-made ceramics that were popular at the time. He incorporated simple instruments and popularised the aesthetic of the simple utensils that are used during tea ceremonies today. There are several different types of tea ceremonies that range from informal gatherings to highly formal ceremonies. The informal is called Chakai, where guests are served sweets, thin tea and a light meal. Chaji is a formal ceremony that includes Kaiseki, a full-course meal followed by confections, thick tea and thin tea. A Chaji can last up to four hours. 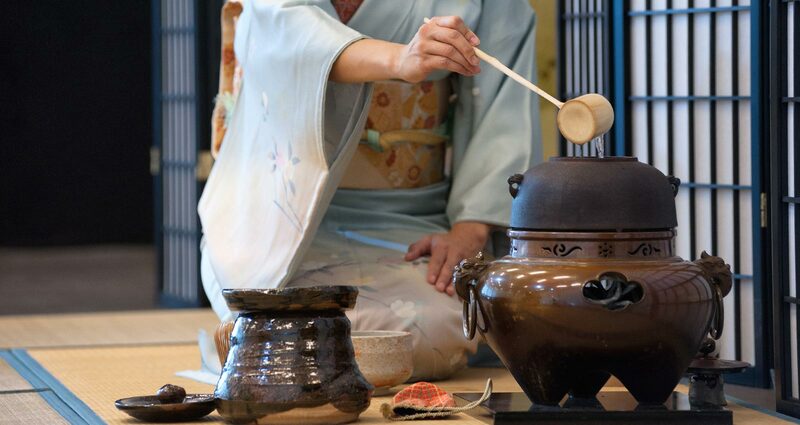 The tools used during a traditional Japanese tea ceremony are called Dōgu. First, there is the Cha-ire, a tall, thin ceramic container that is used to store matcha. Cha-ire is stored in a Shifuku (silk bag). Then there’s the Chakin, a small hemp cloth used by the Teishu (ceremony host) to clean the tea bowl before and after the ceremony. The Chashaku is a bamboo stick with a curve at the end used to scoop matcha into the tea bowl. Most famously associated with the ceremony is the Chasen, a bamboo tea whisk used to mix powdered matcha with hot water. Finally, the Chawan is a shallow bowl that allows the tea to cool in time for the guest to mindfully savour it. How to participate in a tea ceremony differs depending on the time of the year, school of thought and venue. But one thing is common throughout: guests cannot pour their own tea. The Teishu serves each guest. During a traditional tea ceremony, guests begin by washing their hands and mouths, then remove their shoes before entering the Roji (tea room). They then take their place in a kneeling position according to rank. The Shokyaku (guest of honour) sits first, followed by the Jikyaku (second guest) and then Kyaku (the others) and finally the Tsume (final guest). After exchanging bows, the host passes a bowl to the first guest, who then rotates the bowl to avoid drinking from the front. This guest takes a sip, compliments the host’s tea and bowl, wipes the rim and passes it on until the entire room has done the same. After this, the host cleans the utensil and exits the room for a brief intermediary period. When the host returns, a second round of tea is served (this time thin tea), along with more confections. At the end of the gathering, everyone exchanges polite bows, as well as casual conversation, and this marks the end of the ceremony.